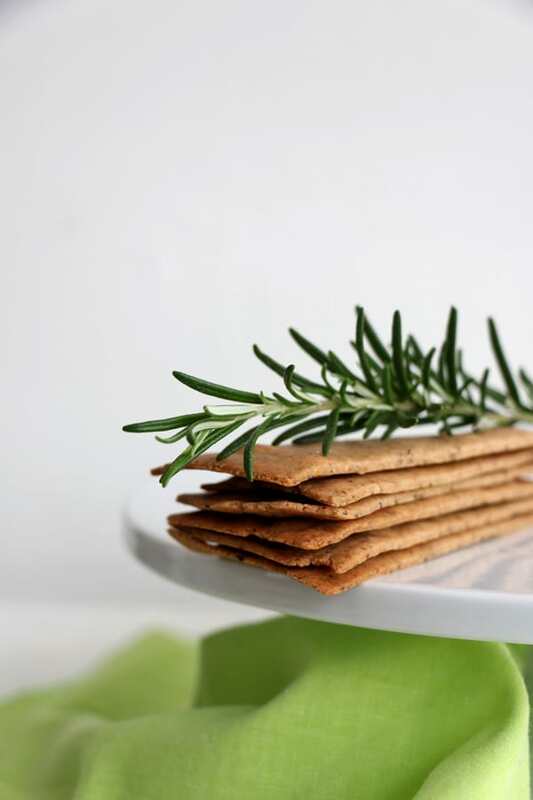 I wanted to develop crackers that are really tasty and really easy and simple to make. 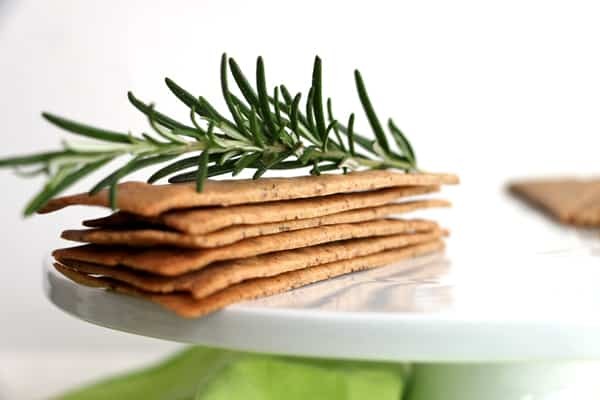 These buckwheat and rosemary crackers recipe does just that; really simple to make, crispy and taste really good. As I have recently cut out eating too much bread, yes, I can definitely over do it on the bread front, these come really handy. Now I treat myself to a nice sourdough loaf of bread from my local farmers market once a week and thoroughly enjoy it. And in the mean time I have these to eat with some yummy dips and lots more veggies hopefully! This is a quick and simple recipe and in no time you will have 32 yummy crunchy crackers ready to enjoy. Fantastic dipped in hummus or just on their own they are a yummy treat anytime, as a starter or part of your lunch. 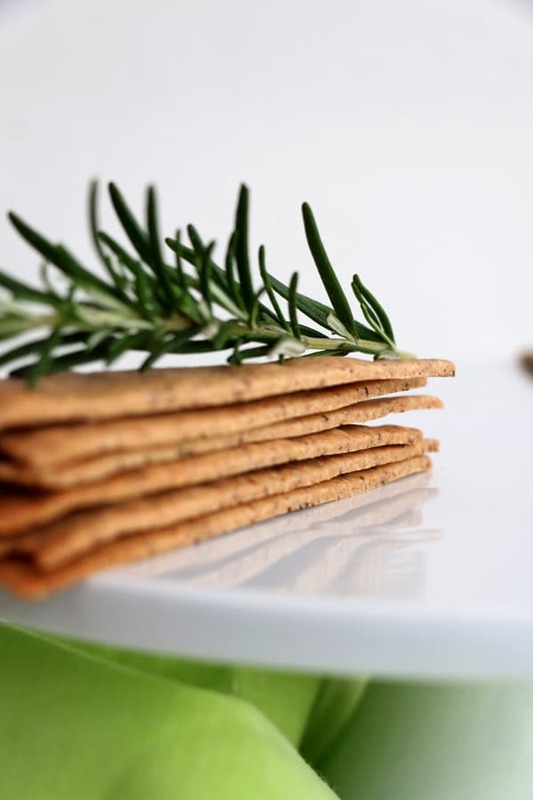 The combination of the buckwheat, almonds and flaxseed works really well and the addition of rosemary gives these crackers beautiful flavour. 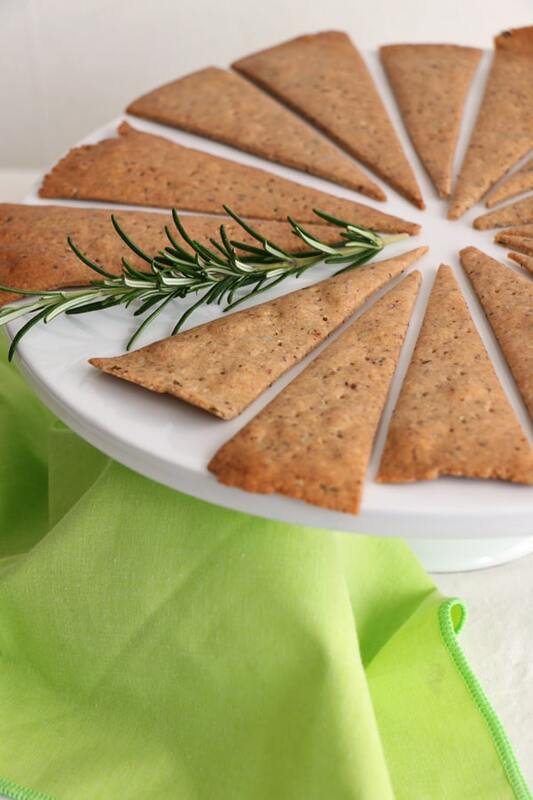 Overall a great healthy nutritious crackers recipe for you to try! In a bowl whisk together buckwheat flour, ground almonds, flaxseed, sea salt, black pepper and chopped rosemary and set aside. Mix olive oil together with water and add to the dry ingredients. Bring together into a dough and knead on a surface until smooth. You can add a little water or flour, the dough should be nice and smooth, not sticky or too dry. Separate the dough into 2 balls. Place one ball between 2 sheets of greaseproof baking paper and roll out until about 2mm thickness. Remove the top layer of baking paper and cut the dough into 16 wedges like you would cut a pizza and prick each cracker with a fork few times. Transfer onto a baking tray keeping the bottom layer of paper. Bake for 10-15 min. Keep an eye on the crackers as the outer edges always bake quicker. You might have to move them around, so they bake evenly. Enjoy with your favourite dip or on its own. Hey thanks for the recipe. I tried to make these and the crackers just got stuck to the baking paper. I can’t even peel it off it’s stuck in like a sticker and when I get a bit off it just rips and the rest is still stuck on. Any ideas? Could it be the paper I’m using? Apart from that the bits I could try were delicious! Thanks for the reply couldve been my mix was too wet. I will try again and let you know how I get on! I found the same issue, even though my dough was perfect, that is if I added more water it would be too wet and if I added more flour too dry. My solution was to dust the underneath baking paper very very lightly with buckwheat flour, and to dust very very lightly the top of the dough as I rolled it out. That worked. I just baked the crackers for the first time and they turned out really good. I decided to spray the wax paper with non-stick spray that I rolled them out on and I left them on the wax paper to bake. I baked for around 16 minutes and they seemed slightly soft, so I turned the oven off and let them sit for around thirty minutes. Thank you Nirvana and Hanna! Any chance you’ve tried this with a dehydrator or know of an appropriate conversion? I just got one and am looking to try out this recipe. Thanks! Is ground almond the same as almond meal? Thanks so much Hana, I tried it this morning with almond meal, it worked beautifully and just needed to add a few extra droplets of water to get the mixture together. Fantastic recipe! Hi Olivia, you’re so welcome:) I’m really happy the recipe worked for you! Hi, Hana! Just made these crackers. Really good! I used a silicone baking mat with parchment paper on top to roll them out. Worked great! When they were ready for the oven I just lifted the mat onto a baking sheet & put it in the oven. No sticking whatsoever! Can I use ground hazelnuts instead of almonds? Hi Anna, I’m pretty sure you can. The taste will be different, but it’ll work. I have tried them and they are amazing!!! I made them today and I just loove how they’re ready to eat in a few minutes :) The taste and consistency are fantastic, although mine look a little darker…Did you use some special buckwheat flour? This is a great recipe – thank you very much! I recently had to stop eating bread and related produce so this recipe came in handy. I made half the batch as is, and to the other half I added turmeric, chilly flakes – and a sprinkling of sea salt flakes on top. Delicious! It is possible to just use 100g ground flaxseed instead of ground almond? I have a lot of ground flaxseed and want to use it! Thanks. Hi Olivia, the flavour will be different, but I think it should work fine in the recipe. Just made those amazing crackers. They are delicious and I am so glad I discovered your blog. I am new in everything gluten and dairy free so I need all the inspiration I can get. I shall soon try your fig and walnut crackers. Is there any chance that you could give your followers an idea of the values of what you make such as calories, etc… Probably very difficult for you as you are not a professional nutritionist, but I am asking, just in case. Finally, I can’t see any bread in your recipes. Is it because it is difficult to make them without using eggs (which I don’t like in gluten-free bread anyway)? 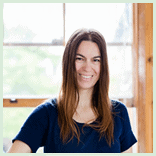 Hi Chantal, I’m so happy to have you, welcome! The nutritional labels are something I’m looking into as I often get asked, so please bare with me :) In regards to bread, the problem is yeast as I don’t really include it in my diet. I would like to experiment with sourdough bread, hopefully soon. Gluten-free vegan bread is so tricky, I’ve tried making quite few recipes already, but not completely happy yet with any of them. Thank you for bringing it up as I really would love to master a decent loaf! I am so glad I found this recipe. I am one of those unhappy folks who can’t tolerate much gluten in my diet. I recently bought a mill and I ground my own buckwheat for this recipe. The first time I followed it to the letter and I liked them a lot. I just made them a second time. This time I substituted a small amount of corn flour I had to make up the cup of (mostly) buckwheat. And I omitted the rosemary and used cracked peppercorn. They were a little sweeter and sandier from the corn, and I like them better with a more plain flavor. It’s nice to have a go to recipe for something I can eat without worries of bad digestive consequences. Thank you!! Great recipe Hana…I also have to have a gluten free diet, there is nothing I can buy that is gluten and palm oil free in the stores. I love a cracker with cheese and and these are perfect for dips too as you say. Really glad to have found you…many thanks. Great recipe thanks Hana, totally delicious first attempt! I may never buy crackers again!! I found (second go) I could roll the mixture on an oiled tray, with flour on top of the mixture to stop it sticking to the rolling pin. That uses less resources. So easy and so yummy! Thank you very much for a recipe I’ll use over and over again. I’d absolutely love to pop these in my boy’s lunchbox but he can’t take nuts into school. Do you have any suggestions for replacing the ground almonds? Would it be fine too cut these into squares instead? Is it just for appearances that these are cut into wedges? Hi Esther, yes, you can cut them any way you like. I like cutting them into wedges as I find that easier. I made these yesterday and was so surprised with how perfect they were. My friends and partner all asked what shop I had got them from. In comparison they taste much better than the ones I usually buy for $7 for a pack of around 12. I am already whipping up another batch again today. So easy, cheap and delicious. You’re so welcome Fleur! 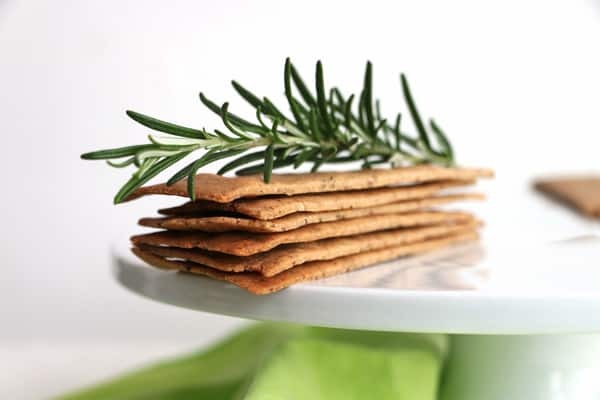 I’m so happy they were such success :) Oh yes, gluten-free crackers cost way too much, so much cheaper making your own and with much better ingredients. I really like this recipe. I’ve made these crackers twice now. I don’t use fresh rosemary regularly, but bought it specially to try this recipe (wasn’t sure if the dried kind would do!). I chopped and froze the leftovers, and used the frozen ones today to make my second batch. They were just as good as the first, despite the frozen rosemary! These are too easy, and so delicious!! I added onion and garlic powder, and love them! Thank you for sharing this recipe! Hello can i sub flax seed with chia seeds ?